October | 2014 | The British in Crete, 1896 to 1913. Even in Crete you couldn’t get away from football. 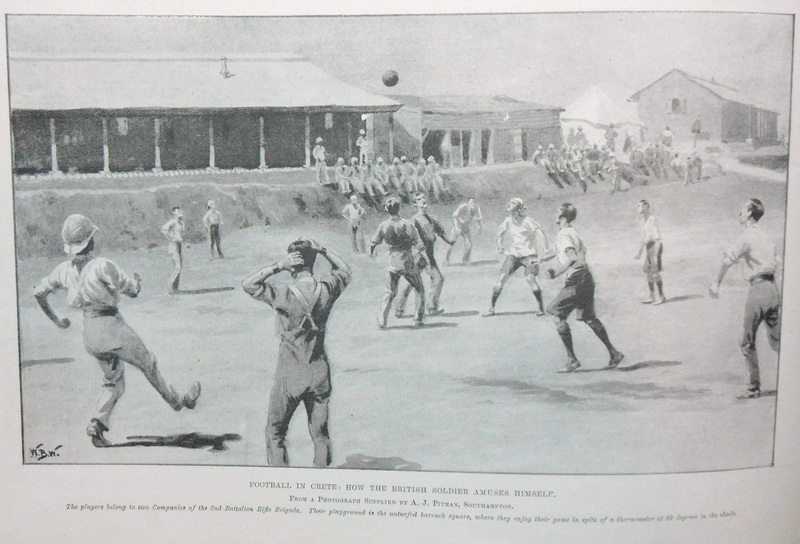 The illustration from 1899 shows two companies of 2/Rifle Brigade playing kickball. The location appears to be outside the ‘Greek Hospital’ in Iraklion [Candia], an unfinished building originally taken over as a barracks by the British. However, when it proved to be too insanitary for that purpose, it was used as a British Field Hospital. The 2/Rifle Brigade arrived in Crete in September 1898 from the Sudan Campaign and during their stay on the island, until October 1899, suffered 50 deaths in a battalion stated as consisting of 19 Officers and 813 Other Ranks. All but one of these deaths were due to illness, mostly Enteric Fever (Typhoid) or Malaria. The other death the battalion suffered was the murder of an Acting Sergeant, killed by one of his men. The murderer was hung in front of the rest of the battalion and of the other British troops. The British memorial in Iraklion also lists one death of a member 2/Rifle Brigade as being ‘killed in action’ on 2 September 1898. However, the battalion didn’t arrive in Crete until 22 September and no other record of any British death by ‘enemy action’ on that day can be found. This entry was posted in British Army in Crete, European Intervention Crete and tagged 2nd Rifle Brigade, Crete 1898, Enteric fever, European Intervention Crete, Malaria, Typhoid on October 7, 2014 by Mick McT.